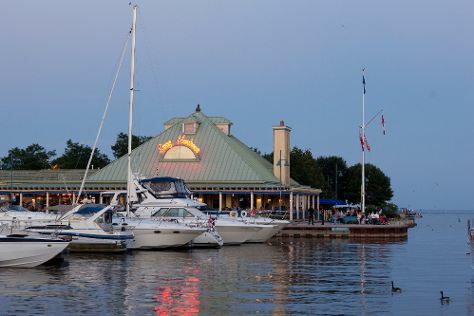 A trip to Mississauga might not be on the top of everyone's Canada itinerary, but many people stop in the city on their journey without realizing it. Canada's six largest--and fast growing--city is home to Toronto's international airport, as well as many corporate headquarters and business parks. Originally intended to be a suburb of Toronto, Mississauga now stands as a city in its own right, with more than 700,000 residents, and an increasingly multicultural demographic. The city's striking skyline includes several distinctive skyscrapers, further cementing it as an increasingly important modern hub in Canada. Mississauga is in Ontario. Take stress off the schedule by using our Canada route planner. Mississauga is best known for housing Toronto's airport-- most of the city's accommodations cluster just a few minutes from the terminal. If you're looking for a place to rest before your flight, you'll find a range of options on Dixon Road, to the north of the airport, or on Eglington Road West to the south. Don't expect much character--your options include mid-range chain hotels and basic inns, with little else on offer. You can find a handful of business-oriented hotels in the city itself, mainly located around Burnhamthorpe Road.